Here is an example on how to use variables and parameters in a Script Component. First you need to add the variables and/or parameters to the readonly and/or readwrite variables. Edit the Script Component and in the Script Pane you will find two textboxes: ReadOnlyVariables and ReadWriteVariables. They are for variables and parameters. Note: parameters are always readonly. Variables can be readonly or readwrite. Now you can use them in the script. There is one big difference with the Script Task: reading and/or writing variables and parameters can only be done in the PreExecute and PostExecute method. // .Net variables to store values from parameters and variables. // The method that executes first is a good place to read variables and parameters. // you must use .Net variables to store the variable or parameter value. // one big drawback/issue: The variable is filled when the Data Flow Task is finished. // still have the old value. 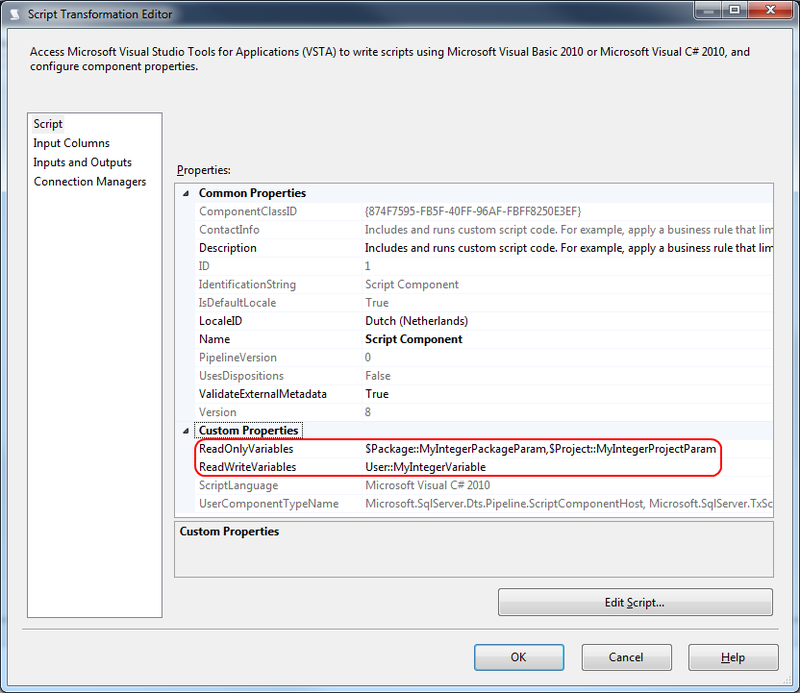 For a VB.NET version of the code, check out this blog post. It also shows a second option with the VariableDispenser, but that isn't the preferred method.